For a long time now the white elephant in the room has been Class D digital amplification. In many ways Class D has been seen as the natural future for driving loudspeakers, in much the same way that electricity is the obvious fuel for powering cars. Unfortunately, the results have been almost equally ambivalent in both cases. Digital amplifiers run cooler, consume less power and consequently, are greener than traditional amplification, which have to be good things. With most music sources starting life as digital once they hit the microphone, it makes obvious sense to preserve the music signal in digital form as long as possible to avoid degradation. But so far, at least, digital amplification in its many and varied forms has not been a conspicuous success sonically and is generally confined to the lower shelves powering cheap integrated systems and their ilk, where simplicity and low cost are the key attractions. Here, perhaps, is an exception to the rule, arguably the most striking example of its kind to date. 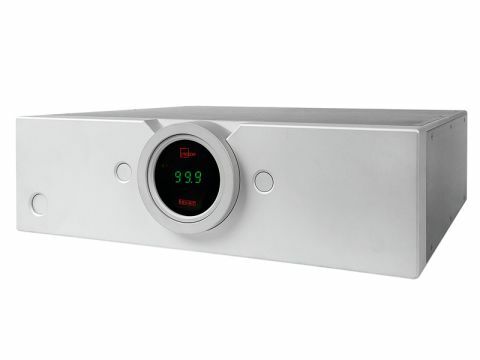 The original and, so far, one of the few truly serious high-quality digital amplifiers was the TacT Millennium, which due to structural changes within the company has been transmogrified into the virtually identical looking and functionally similar Lyngdorf Millennium, now in its fourth iteration. Quite how to describe the Millennium IV is moot. It drives loudspeakers and has a volume control, which qualifies it as an integrated amplifier. But it won't handle analogue inputs without external assistance (described later), and in its basic form as reviewed here, it is more of a power amplifier with an on-board D/A convertor than an integrated amplifier, albeit one that has its own volume control. The Millennium has been around in one form or another since as far back as 1998 – more than a decade ago. But Lyngdorf claims it is one of the few truly digital amplifiers and there are good reasons why this is the case. Most digital amplifiers are only part digital, in some cases because they use a digital architecture for only part of the audio chain. Lyngdorf's enabling digital technology called equibit, is digital from input through to output – in fact as standard the Millennium cannot even accept an analogue signal input and at the loudspeaker end of the chain, the signal remains digital until the very final stage. This involves a simple 12dB/octave filter consisting of an inductor and a capacitor to roll away the very high-frequency digital noise above 60khz that would otherwise pollute the loudspeaker feed. Uniquely, the volume control does not attenuate the audio signal, which would reduce resolution. Over most of its range, all it does is to control the voltage from the power supply output stage at anything upwards of three volts output, which corresponds to 19 on the volume dial. This simple, elegant solution means that the volume control is not in the signal path. Anything above this level and below the maximum output of 58 volts is handled with full 24-bit precision, with the system clock set at 352.8khz, high enough not to interfere with the audio. At very low levels – where power supply attenuation is no longer possible – the resolution of the signal is reduced, but the volume level through the speakers is very low by that point, so the impact on the audio is negligible. By the same token, there is no amplification of the audio signal either, which eliminates another whole set of problems. The Millennium is extremely heavy at over 30kg, with a carcass milled from aluminium, which means it is stable and non-resonant and, therefore, provides suitable screening for the high-frequency circuits inside the case and to prevent radio frequency noise pick-up. It is beautifully built, with Swiss watch-precision and superbly finished, but until it is connected to its host system under power, there is no external indication of what it is. There are a number of sockets around the back and controls on the front panel, few of which will be familiar even to practiced amplifier-watchers. The massive volume control works through two sets of ball bearings, and can be spun freely, though the gearing of the control is very low: you may need several spins of the control to find the level you want. In the centre of the control is a simple display window, which shows such information as the power status, volume and selected input. Sharing the front panel are digital input and analogue input selectors (the latter is not accessible with the amplifier in standard form as reviewed). On the back panel are four digital inputs (one optical), bi-wire speaker outputs, XLR balanced outputs and sockets for connecting the accessory digital preamplifier and RoomPerfect module. A remote control handset is also supplied. This is an exceptional amplifier and one that turned out to be very hard to fault using the usual criteria. The word transparency is often used to describe amplifiers (and other components) which are not readily identifiable when working, which don't have an obvious aural signature and this is true of the Millennium Mk IV in more ways than one. First, it is literally transparent: there is no sense of anyone pulling the strings behind the scenes. There is nothing manipulated in the way it sounds, or that points to any distortion signature that we could identify. Tonally, it isn't warm or cold, it just is. Better still, this is one of the most seamless amplifiers we have ever encountered for its consistency across a broad volume envelope. With the loudspeakers available to us – Monitor Audio Platinum PL300, Mordaunt-Short Performance 6Le and Sonus faber Liuto Monitors – the system remained very flat (ie neutral) tonally and completely in command. So far as we could tell, it sounds consistent at any volume level within the compass of the speakers. Bass quality is unusual. It's powerful, with a strong measure of authority and drive, but most of all the bass is taut, tuneful and agile. The amplifier sounds much the same at all volume levels, with nothing obvious to indicate that it was running out of steam. Which is exactly what you'd expect from the product description. But, in part, because the amplifier is so consistent, we found it was possible to drive at least some loudspeakers beyond their comfort level, the Sonus faber Liuto Monitor, for example. There is one postscript to this. On the whole the amplifier doesn't sound bright or harsh, but there were occasions with some loudspeakers when the sound became slightly exposed; the sort of situation which with other amplifiers might have been best accommodated with a slight reduction in treble level. In this case, unless the room DSP module is available (and it wasn't for this test), turning the volume down by a decibel or so is enough to calm the response, with no noticeable impact on detail. With other amplifiers this trick often results in a noticeable loss of precision. If there is a single word that could be used to encapsulate the Millennium Mk IV's ability, it would have to be discipline. No matter what is playing, it sounds consistent as described earlier, finely detailed and, above all, as tight as a drum. Most of all there is no slackness in the sound and also none of the slight texturing that is usually part and parcel of solid-state amplification, or the loss of definition that is often found with valve amplifiers. The only caveats that should be borne in mind are its obvious functional limitations, which we have identified earlier and certain physical shortcomings that don't amount to much, but which may prove irritating. One is the lack of any indication that the unit is under power, as there is no panel illumination at all unless the input is correctly selected and identified by the amplifier. A pair of handles on the rear panel would have made handling such a heavy lump easier. On the other hand, the free-spinning, ball race-assisted level control more than makes up for any perceived limitations. We're not convinced that the ultra-slow volume gearing can be justified, but it invested the unit with an exquisitely tactile feel unmatched by any other amplifier in our experience. Implicit in the amplifier topology developed for the Millennium, there is a degree of mild interaction with loudspeaker impedance. In most cases you can expect a half decibel or so variation across the audio band, depending on the impedance plot, but this was not identifiable with any of the three speaker models used for this test. According to Lyngdorf, even loudspeakers with quite punishing behaviour, such as Martin Logan (many of whose models are nominally eight ohms, but drop down to one ohm or less at high frequencies) still match well, though we weren't able to confirm this. Many valve amplifiers and some solid-state analogue amplifiers behave similarly, usually without troubling consequences. This is an exceptional amplifier, which is authoritative and thoroughly musical in practice. It's excellent with high-resolution speakers for extended listening and this is the first digital amplifier for which we've been able to make this claim. Anyone interested, who is not in the Lyngdorf's financial league, should look at the much cheaper TDA2200, which has many of the same design features and which includes a full DSP section for room/speaker equalisation.